A Midwest locomotive manufacturer was seeking to refinance its existing senior credit facilities and derive additional working capital. The company was under served by the incumbent bank who was not providing sufficient liquidity. Additionally, the company believed the incumbent bank was mired in its internal politics and became unresponsive and unhelpful as a result. The incumbent bank had decided the credit was too small for its portfolio. The company retained Concord as its exclusive financial advisor to arrange a more attractive capital structure and identify a bank that understood the company’s business and objectives. Concord quickly identified the most appropriate senior lenders for the company and prepared a detailed memorandum summarizing the key aspects of the company and the situation. Concord also served as “arbitrator” between the company and the bank, resulting in a more favorable situation for the company as it searched for a new lender. 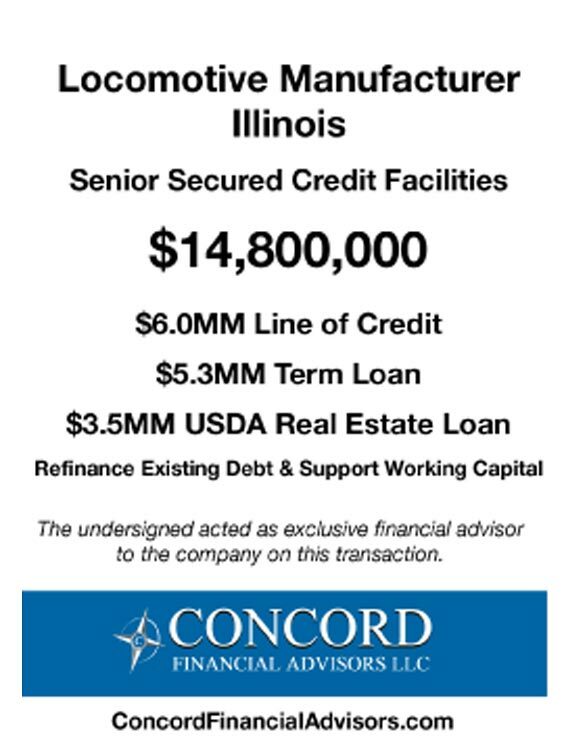 Concord conducted a targeted and efficient deal process with traditional commercial banks and asset-based lenders along with a nationally recognized USDA real estate lender. The process resulted in multiple competitive proposals for the transaction. The company was able to achieve its primary objective of obtaining an attractive financing structure with a local bank in the commercial banking department with limited personal guarantees. Their secondary objective of having a second bank involved was met by obtaining a USDA real estate loan for its manufacturing facility from another bank.